To celebrate the launch of our new-look website we have teamed up with Chiquito in Milton Keynes to give away a free meal for four. We have teamed up with Chiquito to celebrate our new-look and improved website as well as a new menu at the popular Tex Mex restaurant by offering one lucky winner a free meal for four people. Known for their fun, vibrant eating experiences Chiquito’s new ‘Street Food’ offering is not the only addition to the menu at its restaurants in the city. 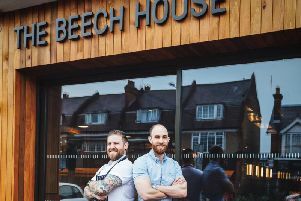 The popular chain is also pushing a renewed focus on getting skilled chefs getting hands on in the kitchen with a huge emphasis on daily preparation. Every day the chefs will be hand-pulling pork shoulders for their succulent pulled pork, freshly chopping vine tomatoes for their Pico De Gallo Salsa and hand cutting their Tortilla chips which are seasoned with Mexican Spices. The atmosphere at Chiquito Milton Keynes is friendly, fun and relaxed perfect for special occasions or even meeting up for drinks and sampling an impressive list of cocktails at the bar. Service is attentive and with a smile but not too intrusive and you even have a sombrero at your table which makes for some great photos and memories. If it’s your birthday the whole restaurant will know about it with everyone joining in the celebrations Mexican-style. There is huge variety in the street food offering and you get to choose a number of dishes which are then served tapas to your table, ideal for sharing. The street food burrito is the gem of the menu, though, packed full of flavour and will leave you with a full belly. You can enjoy all this and more and all you have to do is answer the following question and email your answer to damien.lucas@jpress.co.uk being sure to write CHIQUITO COMP in the subject header and provide your name, address and contact number. The deadline for entries is midnight on April 29.